Polyginum Bistorta, natural order, Polygonacae. It is also called Sapentary Dragonwort, Osterick, and Passions. It is a beautiful wild plant, growing in shadowy moist woods, at the foot of hills, and in some meadows. It flowers about the end of May, and the seed is ripe in July. It grows about a foot and a half high. The leaves are broad and pretty, and long like a dock leaf, a little pointed at the ends, of a bluish green colour on the upper side, of an ash-coloured grey, and rather purplish underneath. The flowers grow in a thick spike or ear, at the top of the stalks, and are of a bright red colour. 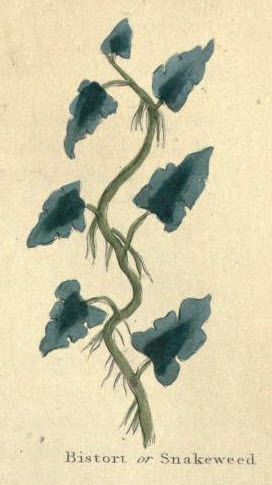 The stalks on which the flowers stand have a rim of the leaf running down them; the stalks are round, firm, and erect, of a pale green, almost without leaves, or with very few and narrow, placed at distances. The spike of the flowers is as long and as thick as a man's thumb. It has a thick short knobbed root, crooked, with black threads, and it has an astringent taste. They grow in gardens, and wild in many places. They seed in August and September. They are cooling, astringent, and useful in fluxes of blood, especially the red; which restrain the overflowing of the courses, as the white Blites stay the whites. It is an excellent secret, you cannot well fail in the use. Both the leaves and the roots have a powerful faculty to resist poison. The root is one of the best astringents in the world, and is used in mucous discharges, passive haemorrhages, and fluxes.